Eurasian Week International Forum, the largest forum within the Eurasian Economic Union having taken place on October 22-24 in Yerevan (Armenia) was opened with the plenary meeting “EAEU Real Economy: Building Capacity Against the Backdrop of Integration”. Opening the meeting, Prime Minister of the Republic of Armenia Nikol Pashinyan noted that business community showed strong interest in the Eurasian Week forum – it is attended by more than 300 Armenian enterprises ready for continuous cooperation with Eurasian partners, investment raising and building up interaction. “Armenia demonstrates stable growth rates in trade and cooperation with the EAEU Member States. Export supplies from Armenia to the EAEU countries increased in January – July 2018 by 31.3% as compared to the similar period of 2017, equaling to 351.9 mln dollars. The growth is attributable to the markets of almost all Member States, – reported the Armenian Prime Minister. – It indicates the sustainability of Armenian membership in the EAEU, which affects economic development and export activities”. 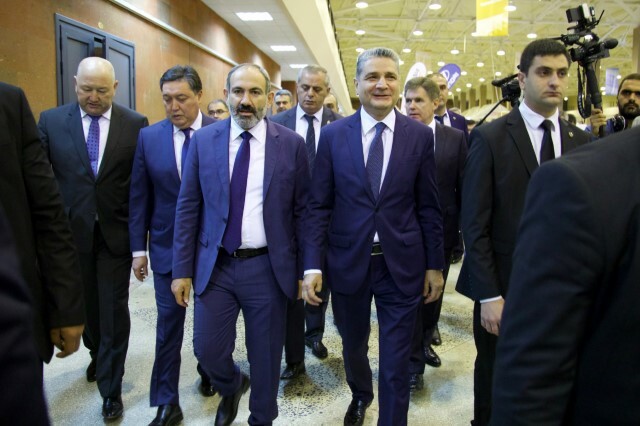 Nikol Pashinyan drew attention to joint development of innovative businesses in the Union. In Armenia alone there are as many as 400 high technology cycle enterprises seeking to develop cooperation with EAEU partners for joint entry on external markets. The Chairman of the Board of the Eurasian Economic Commission (EEC) Tigran Sargsyan also delivered his welcome address to the members of the plenary meeting. He noted that the forum’s general line would include the issues of cooperation and discussion of the projects in various economic sectors. “Creation of large projects to unite all the countries of the Eurasian Economic Union is one of the key elements in the Union’s development strategy. We want to enter on the global market with Eurasian brands – recognizable, jointly manufactured products and new technologies”, – emphasized the Chairman of the EEC Board. “Bearing in mind a high relevance of choosing the collaboration model we won’t side-step at the “Eurasian Week” this year the issues of the Union’s development strategy, meaning the collaboration model that we are implementing as well as international agenda, institutional changes and our vision of the future. The Union is developing, and we actually need to pursue common and single policies in a number of sectors. Otherwise, we will be repeatedly faced with criticism concerning the operation of common markets. Any eliminated barriers will be superseded by the new ones for totally objective reasons – due to discrepancies in regulation and construction of supranational law. This is the case when the enhancement of supranational concept will ensure better protection of national interests as well as facilitate the buildup of competitive advantages of the Union countries, primarily for export access”, – said the Chairman of the EEC Board. In his opinion, the dialogue between public authorities and businesses at the “Eurasian Week” on the projects that may be potentially implemented and the single rules to be required for them within the Eurasian space, will contribute to the formation of the future Union’s vision and the Commission’s activity plans. The session was attended by Vice Prime Ministers of the EAEU countries and the CEO’s of the largest companies of the Union countries. The managing editor of NTV program “Delovoye utro”, a newsperson Tatyana Naumova moderated the plenary meeting. Currently, the representatives of public authorities and businesses who took part in the meeting are sure that strong economic, labour and cultural relationship between the Union countries has already promoted the formation of high-quality space and new business opportunities. However, elimination of administrative barriers, facilitation of B2B- and B2G-interaction procedures, increase in efficiency of transport infrastructure and introduction of digital solutions still remain the global integration challenges. During the plenary meeting, the participants brought up such issues as achievements of the EAEU Member States in establishing favorable business climate and measures aimed at its subsequent improvement, strengthening of production relations. First Deputy Chairman of the Government of the Russian Federation – Minister of Finance Anton Siluanov told about the Russian experience of improving entrepreneurial climate. While in 2012 Russia ranked 120th in World Bank’s Doing Business, in 2018 it moved up to the 35th position. “We analyzed the positions for which we were behind the other countries, drafted “road maps” for the “weak” areas, and created the national industrial initiative. All our actions were controlled by businesses and we “ticked the box” only after entrepreneurs admitted that the task had been completed”, – stressed Anton Siluanov. Hence, many issues were resolved including those related to utility connection, registration of property, receipt of construction permits, etc. Public authorities are now applying this experience for Russian regions. First Deputy Chairman of the Russian Government also encouraged the colleagues to improve business environment in a concerted effort. “The more common, uniting, single regulatory acts assimilating the best practices we adopt, the better entrepreneurial environment will be established”, - summarized Russian Vice Prime Minister. Armenian Vice Prime Minister Mger Grigoryan pointed out the importance of integration effects, in particular, the Agreement with Iran opening an entrance for the EAEU through Armenia on a sizeable market, we cannot but obtain benefit in this situation, especially, taking into account the current GSP+ customs preferences treatment in Armenia with the European Union as well as GSP treatment with the USA, Japan, Switzerland and Norway. “Business community of the EAEU countries will unfailingly get an insight into the opportunities in order to use them as both commercial arbitration and direct bilateral relationship. Moreover, the Iranian and Armenian parties have created free economic activity areas at the border. We will further scrutinize which directions will require development, elimination of barriers, and facilitation of procedures”, – stated Mger Grigoryan. Deputy Prime Minister of the Republic of Belarus Igor Petrishenko highlighted that it was necessary to promote brands within the EAEU and to avoid the so-called protectionist measures. “Generally, the Union must maintain fair competition policy for our companies to interact at the EAEU market in close cooperation and to promote our common brand on external markets”, – believes Belarusian Vice Prime Minister. As an example he mentioned large manufacturing companies in Belarus such as Tractor Works, Minsk Automobile Plant, BelAZ that produce about 30-50% of components in conjunction with Russian enterprises – cooperation partners. First Deputy Prime Minister of the Republic of Kazakhstan Askar Mamin mentioned high rates of economic development in the EAEU. “Following the results of nine months, economic advance in Kazakhstan was fixed at the level of 4.1%. Trade growth within the EAEU equaled 15%, with third countries – 23%, - said Askar Mamin. – Notwithstanding the positive trend, one of today’s main challenges for our economies is mitigation of consequences of the anticipated economic growth deceleration forecasted by the leading institutions”. He added that 14 industrial platforms and more than 100 projects had already been formed within the EEC with the work being pursued for them. Their implementation will enable to minimize negative effects. Vice Prime Minister of the Kyrgyz Republic Zhenish Razakov reported that over the three years of membership in the EAEU the production output of Kyrgyzstan had increased by 111% with the particular emphasis being placed on use of domestic raw materials, development of consumer goods, processing, ore mining and other significant industry sectors. A two-year grace period in the EAEU enabled Kyrgyzstan to resume production facilities which were earlier frozen or suspended. The country’s accession to the EAEU ensured tariff preferences upon importation of 166 commodity items, thus contributing to positive dynamics and launch of investment projects. The Russian-Kyrgyz Development Fund does a very efficient work. More than 750 SME projects are being implemented on the territory of Kyrgyzstan for the total amount exceeding $250 mln. “In general, membership in the EAEU provides us with certain prospects and stability in production and export of goods”, – summarized Zhenish Razakov. The Eurasian Week Forum is an annual event held by the EAEU countries and the EEC. The initiative to hold the forum was approved in May 2015 by the decision of the five Prime Ministers of the Union Member States. The event includes business and exhibition parts and enables to establish B2B- and B2G-contacts. The forum was first held in October 2016 at the venue of “Open Innovations” Moscow International Forum. The second forum took place in August 2017 at the EXPO venue in Astana. The event annually gathers more than 2,000 attendees from the EAEU States and third countries.